Fasten your seatbelts, my friends. We've got a lot to cover! 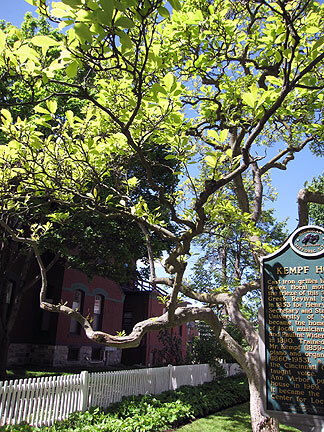 Kempf House was built in 1853 in Greek Revival style, but interprets life in the late 1800s. I'd been inside a few times, with my friend Carole, to help decorate for Christmas. 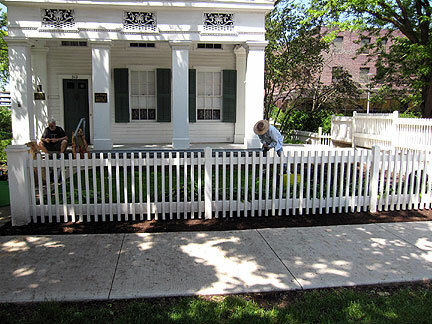 My assignment today was digging soil out of the beds between the fence and sidewalk, moving the soil to other parts of the garden, leveling the area, and adding mulch. 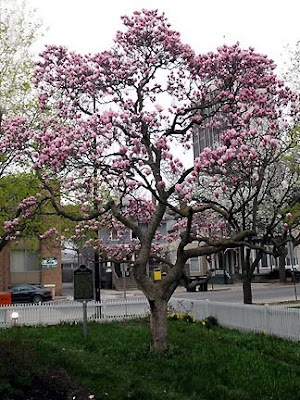 At my first volunteer session on May 9, I weeded around the base of this gorgeous saucer magnolia (Magnolia x soulangeana). It's over 100 years old, and I was sorry to have missed its pink blooms. Update: Deb just emailed me a photo of the tree in bloom in April! I swear, the German connection is incidental! Ne, wirklich! 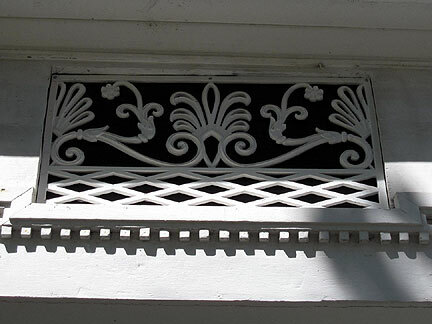 One of the "grilles" mentioned in the sign. I took this photo last time. I love how the bloodroot (Sanguinaria canadensis) intermingles with the hosta. The bloodroot flowers early, before the hosta is fully unfurled, and will die back later, letting hosta steal the summer show. 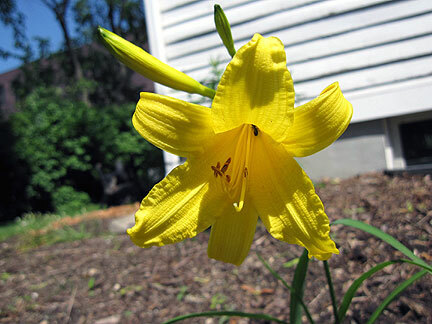 ...as was this NOID lemon yellow day lily. It had a nice scent. The plan is to plant more lilies. 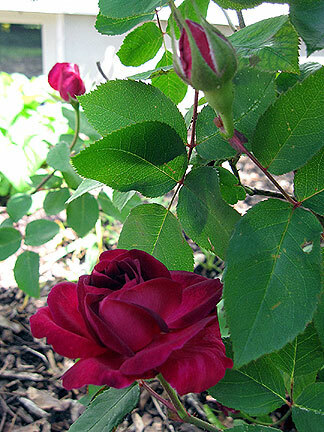 This large NOID rose caught my eye. I liked how the leaves are backlit by the sun so you can see the leaf veins. I'm warming to roses... I love how the rugged calyx and the serrated, darker leaf margins. Lots going on; too much to write about. I haven't seen the groundhog all season, but someone has eaten my beet foliage. I'm pretty sure it was raccoons, a species I haven't had trouble with before. Someone also ate most of my marrowfat peas, but (knock wood) two remain. Even though columbine are notorious self-seeders, I've always had trouble growing them in the garden. I have a few plants, but they only get maybe two to five blooms each. Then I find this columbine growing in extreme shade in the brick pathway next to my deck. I get it, Mother Nature, and appreciate your sense of irony. 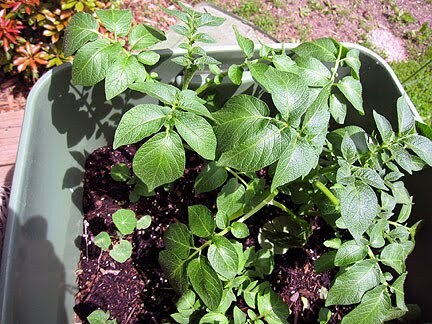 Speaking of which, for the first time ever I had trouble getting nasturtium seedlings to sprout... and look what I found growing in the bin with my potatoes! I ask you! Last week I was meeting my friend Mary Helen for lunch, and decided to ride my bike the 5 or so miles. I was huffing and puffing, but I didn't have a heart attack. I could even pedal up all the inclines, even those I used to have to walk up. And I made amazingly good time. I was just starting to feel the tiniest bit smug when the Universe humbled me: a 60ish-year-old gentleman (a regular guy in street clothes, not a super-aerodynamic bike racer) passed me at a clip that made me feel like I was standing still. Heh. I had my camera with me and used the extra time before lunch to take some photos of the University of Michigan's North Campus. 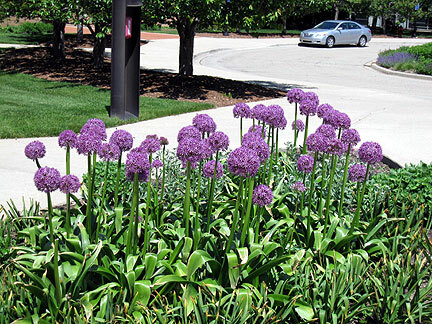 Allium, with no yellowing leaves! I almost fell over, I was so shocked to see this Alexander Liberman sculpture. 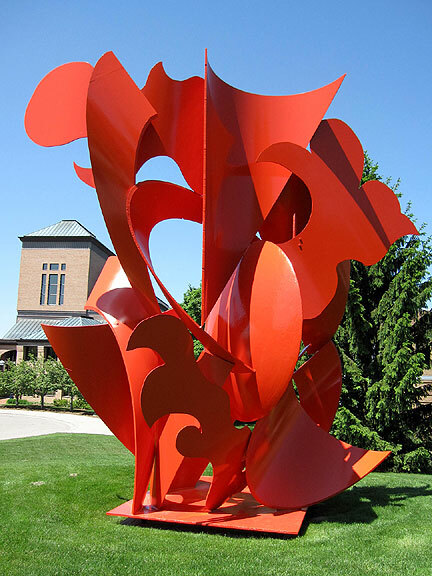 Not just because I oohed and aahed about his work at Meijer Gardens, and totally have a thing for orange, but because I'd never noticed this piece before, despite having been to this part of campus dozens of times over the eight years I worked nearby. Let's just say my job left me preoccupied! 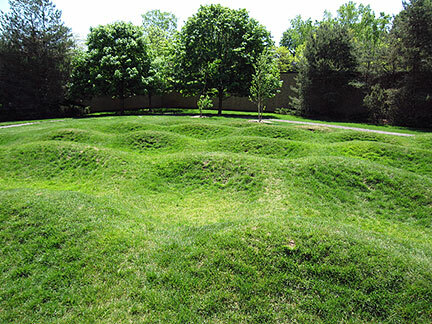 I also like the Wave Field, which reminds me of Native American mounds. 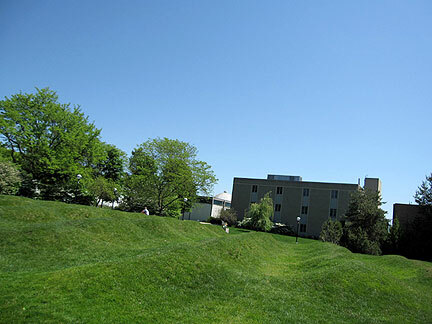 The mounds are only maybe 3-feet tall, but I went ahead and rolled down one anyway. You kind of have to. Well, OK, you might not, but I did. "Dude, some lady in a bike helmet just totally rolled down the mound!" Lots more to catch up on, but I'm heading into the garden now. Happy Sundries Sunday, everyone! An interesting post....full of fun and facts. It always amazes me that plants turn up where you least expect them to. I have struggled this year with a few species and yet there they are dotted all over the gravel drive. Not really where I want them. I love that old Star Magnolia, such character. Bloodroot and Hosta together is a great idea. Monica, I love your Sundries Saturdays...I just love saying sundries...I know--I'm weird, but we just don't have sundries anymore--and what is a sundry anyway? I fell in love with the Kempf House. The only thing I like better than old homes, are old plants. I have an orange thing too. Maybe that sculpture is a new installation--it is impressive. You had me laughing out loud at the mental picture of you in bicycle regalia rolling down the waves. How cool! Those rambunctious raccoons! You will have to put them on notice! Loved your post--happy Sundries Sunday to you! I would be rolling down the hills with you Monica. What a hoot. Give em something to talk about. You have been quite busy. I think it is fun to find something growing where you don't expect it. 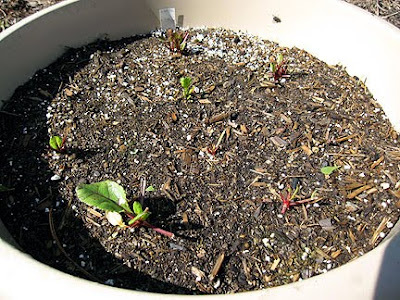 Hopefully you can sprinkle some seeds around where you want those columbine and they will take. I love the house and the grillwork. Just beautiful! 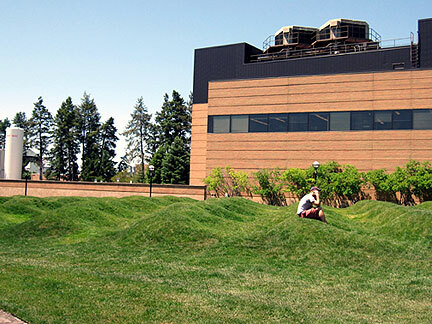 I would hate to mow those wave hills! Good for you to roll down the hill! Not so good pulling the goutweed. Good for you cycling. Two goods sure outweigh the bad huh? That is one pretty house. So nice to restore it and the garden to its original state. HI Monica, what are those waives? Interesting. We have Liberman's orange Symbol here in Rockford. Not my cup of tea but nobody asked me to pick a sculpture. Our practically bankrupt town/ county/state are selling off historic homes. Sad, huh? Monica, you are a stitch! Your good heart and long arms wrap around all that you love. 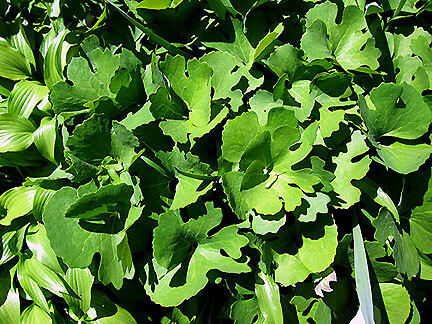 (Wish you could have snitched some bloodroot ... mine disappeared this spring). By the way, great photos! I guess Mother Nature is letting you know who is boss. I thought I had cosmos coming up as volunteers, but now I'm pretty sure they're poppies. Last year I had a single poppy come up, so I decided what the heck and threw out a whole bunch of seeds--I think every one of them is coming up! 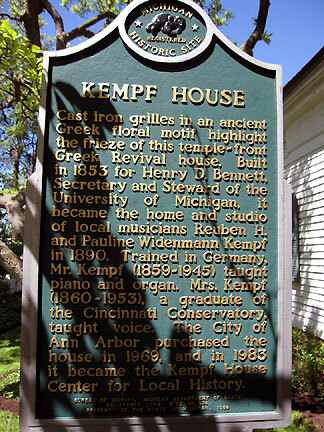 Volunteering at the Kempf house sounds really interesting. 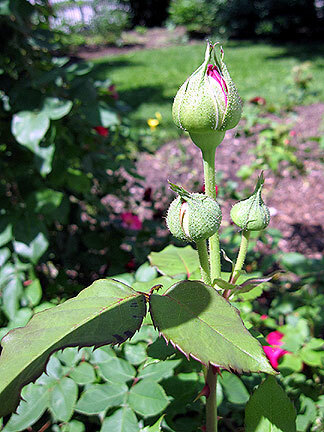 I'm curious what kinds of plants were typical of a late 19th century garden--I hope you'll post more about this garden. Good for you for rolling down the mounds. The kid in you lives. 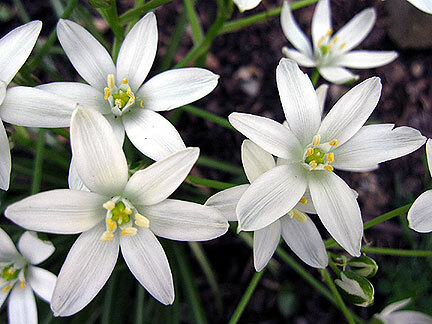 People plant Star-of-Bethlehem on purpose? 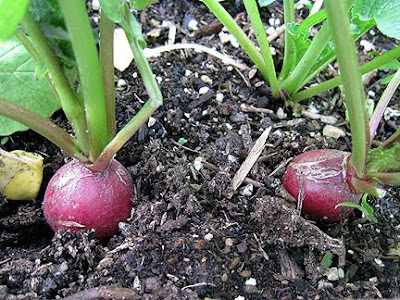 Here I thought it was just a weed growing in my garden. Maybe I should move it out from the spot it is growing in and pamper it some. I enjoyed your sundry subjects. I am laughing about the hill, too. I think I would have joined you, though. 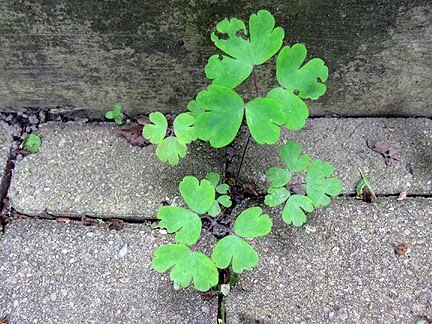 I was wondering if your plant in the crack could be meadow rue. 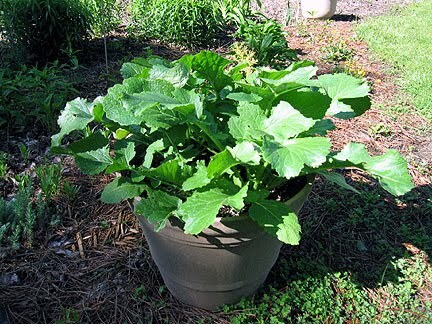 I just planted some, and it looks similar to columbine. That's what I thought yours was, until I read what you wrote. Good for you for riding your bike. I stopped riding mine when they said I have osteoporosis. I was afraid of falling and breaking a bone, but when I tripped on Heidi's leash and sprained my knee, without breaking anything, I decided my bones weren't so fragile. Now, I need to get back fit enough to ride it. I hope you get a decent harvest from what's left. Our rabbits are more destructive than usual this year. What fun Monica! Those little hills are pretty neat - I'm surprised you didn't try riding your bike over them. They remind me of an area near the bike trails and the Chicago River at River Park where I used to play as a kid growing up on Chicago's north side. We'd ride over them and hum, giggling over our wavering voices as we rolled up and down the bumps. That's quite a colony of bloodroot - must like being in the company of hostas!